The use of bear gall and bile in Traditional Chinese Medicine has both cultural and historical significance. 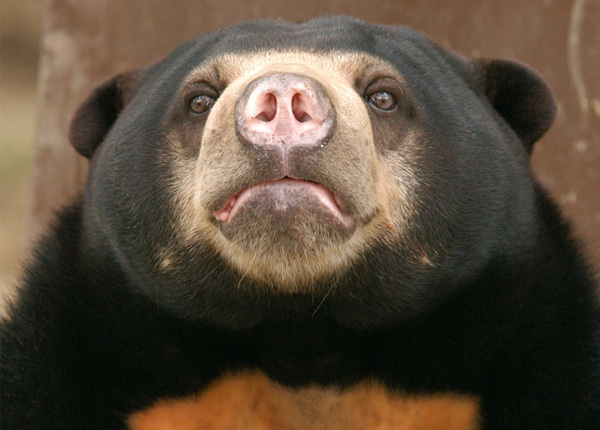 The world’s eight bear species are unique due to their production of UDCA, and their bile and gall are valued for their ability to treat numerous medical ailments. This demand has driven the market for bear bile and gall, and has had a negative impact on Asian bears specifically, both within the wild and in bear farms. 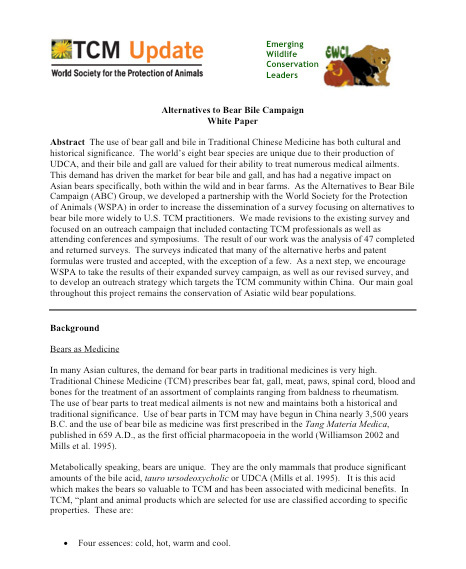 The Alternatives to Bear Bile Campaign (ABC) project group developed a partnership with the World Society for the Protection of Animals (WSPA) to increase the dissemination of a survey on alternatives to bear bile more widely to U.S. TCM practitioners. We made revisions to the existing survey and focused on an outreach campaign that included contacting TCM professionals as well as attending conferences and symposiums. The result of our work was the analysis of 47 completed and returned surveys. The surveys indicated that many of the alternative herbs and patent formulas were trusted and accepted, with the exception of a few. In a final white paper completed with input from our partners at WSPA, we compiled the details of this process and evaluation. -American Association of Zoos & Aquariums, Tampa, Fl. -Carnivore Conference biennial meeting in St. Petersburg, Fl. -Heightened visibility/credibility of WSPA (and conservation NGOs) with key target audience: TCM community. We received 47 completed surveys out of a total of 305 distributed. This computes to approximately a 15.4 % response rate. This is above the benchmark of success for such survey efforts (10-12%). Several factors could increase the response rate: 1) inclusion of an address to send the survey in after the conferences were over; 2) increased staff capacity to follow up personally on the surveys that were mailed out (only 15% follow-up) as well as to attend more conferences; 3) a clear incentive for practitioners to return the survey; and 4) the need to distinguish the survey from the overwhelming amount of paper material that practitioners may have received at the conferences. Our survey response did allow for initial identification of apparent trends in the use of alternatives to bear bile as well as gaps in the need for identification of new alternatives in areas where no trusted products currently exist (at least not among the alternatives listed in the survey). Long Term Project Impact: TCM practitioners in the United States are an important intermediate target for reaching the Asian TCM audience. Aligning efforts with US-based TCM practitioners will allow WSPA and others working for a future for wild bear populations to benefit from U.S. practitioners’ experience and wisdom regarding herbal alternatives. Chinese practitioners are very receptive to messages and trends in the world wide TCM industry. In particular, US-based TCM practitioners play a key role in emerging TCM practices, ultimately targeting the TCM industry in Asia. Expanding the amount of data collected from TCM practitioners in the US will provide increased support and rigor to advocacy efforts targeted at reducing the use of bear bile in TCM in Asia. 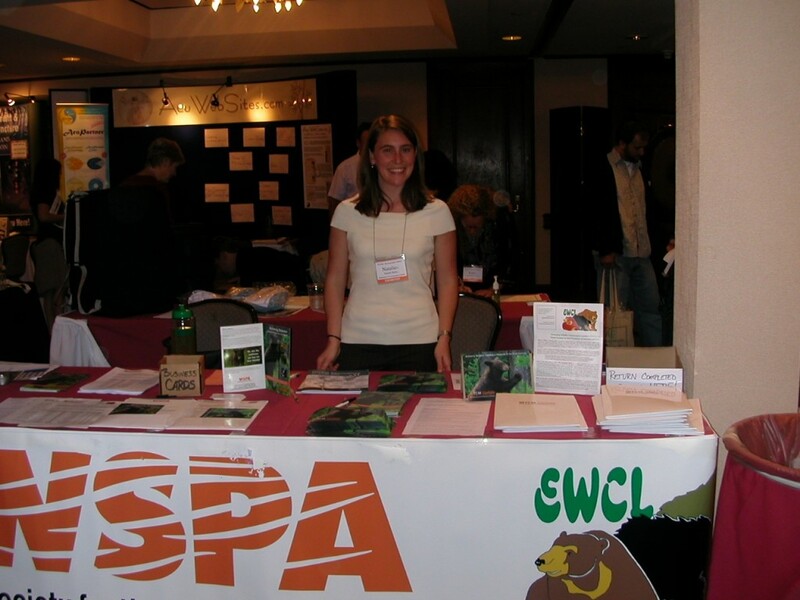 Because this effort is connected to WSPA’s global efforts to advocate for bear conservation and welfare, the work completed through this ABC project will continue to have a positive effect on populations of wild bears that are under threat for their bile beyond the life of the ABC member involvement. As a result of the surveys, WSPA will use the added results to reach out to Asia-based TCM practitioners to highlight innovative approaches within the field that are consistent with the aims of TCM. Furthermore, the significant number of new contacts within the TCM community established by this project ensures the conservation community’s place in the TCM arena.